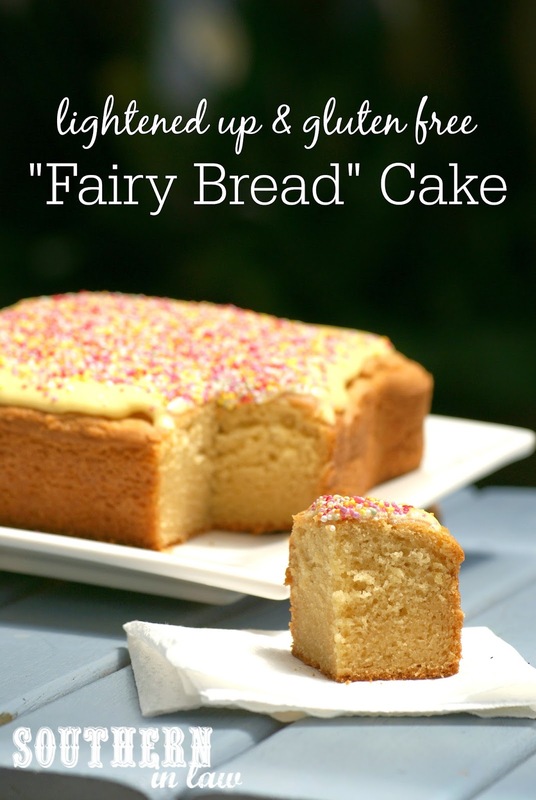 I think one thing every Australian kid thinks about when they think of a kid's party is fairy bread - so naturally, when I was thinking up ideas of what to make for our Australia Day get together this year, my mind went straight to this Aussie party treat! But I didn't want to make normal fairy bread. Forget boring old white bread, slathered with butter and liberally covered with sprinkles - I wanted something bigger and better. I wanted a Fairy Bread Cake! So I set to work on creating exactly that. What I came up with was the most incredible cake that the entire SIL family became instantly obsessed with. And when I say entire I mean even my fussy sister who "hates cake" and usually won't even try a single bite asked me if I'd make this cake as her birthday cake from here on out because she loved it. With a fluffy, butter cake base and buttercream frosting topped with sprinkles - you would never guess this cake was healthier in the slightest - and that's what makes it so awesome. You can have your cake and eat it too, without a speck of guilt as it's lower fat, lower sugar, gluten free and whipped up in minutes. Best of all, this Healthier Butter Cake Recipe is the perfect base for any kind of cake - so you can use it for birthday after birthday and celebration after celebration; whether it's topped with pink princess-y decorations or chocolate fudge frosting and dinosaurs. A healthier butter cake recipe that's perfect for any celebration topped with buttercream frosting and sprinkles to look just like a giant piece of fairy bread! Serves around 20-30 people, depending on the size of your pieces! In a separate bowl, sift your flour, baking soda and pinch of salt and set aside. In a mixer, beat your butter and sugar until light and fluffy, scraping down the edges a couple of times inbetween beating to incorporate everything. Next, add in your flour and mix just enough to combine with your butter mixture. Add in your milk and beat your cake mixture for 1-2 minutes or until smooth and fluffy. Pour your mixture into your prepared pan(s) and bake for around 30-50 minutes, or until a skewer inserted into the middle of your cake removes clean. Baking time will depend on the thickness of your cake, so keep an eye on it. If the outside of your cake is browning too quickly but the inside still isn't cooked, simply cover it with foil and allow it to finish baking whilst covered. Leave your cake to cool before removing it from the tin. This cake will keep for up to a week (if it lasts that long) at can be kept at room temperature or in the fridge, depending on whether you frost it or not. We always like to keep frosted cakes in the fridge but if we're leaving the cake plain we'll keep it at room temp. Frost or decorate with whatever your heart desires! *This doesn't make an overly sugary sweet cake, so if you like things sweeter, use around 3/4 cup (150g) sugar. This recipe will also make ~16-20 cupcakes (the half batch recipe is here as our Lightened Up Lamington Cupcakes) or two 6-8" round cakes which can then be layered if desired. Beat your butter and sugar until light and fluffy, adding a touch of milk if needed. We actually didn't use all of the frosting for this cake (only about half), however, if you're looking to cover the whole cake you'll probably want to double it. There's no real need for instructions or ingredients here, just liberally cover your cake with sprinkles/100's and 1000's of your choice! 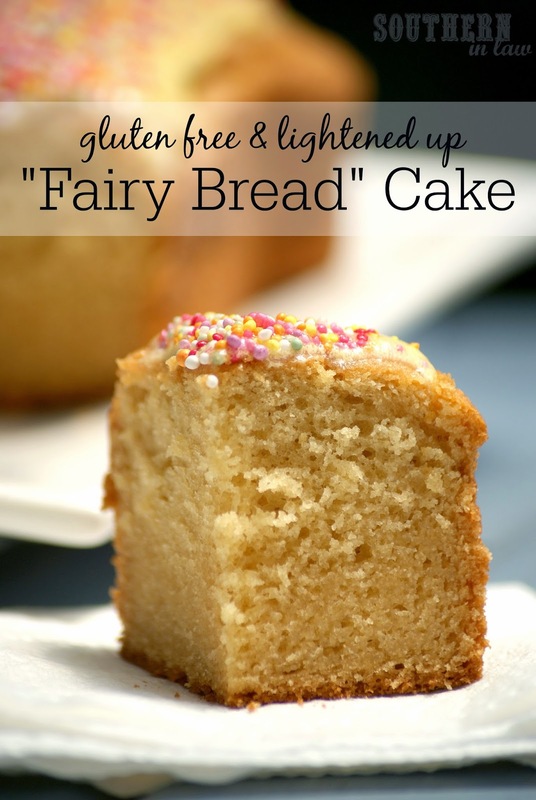 We used a gluten free naturally coloured pack we found at Coles! But tell me, what was your favourite "Kid's party food" as a child? It's so fascinating to see treats that are special to each country. 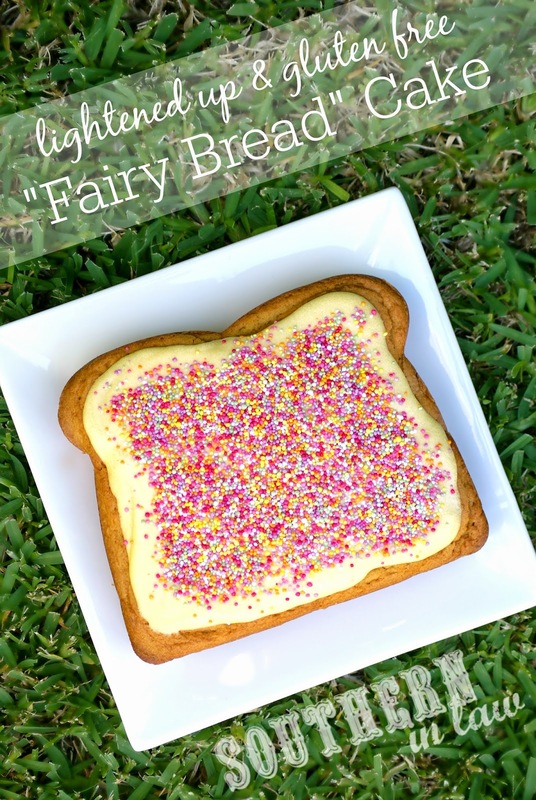 Fairy bread I have seen before and instantly fell in love with it because I love everything sprinkles!! 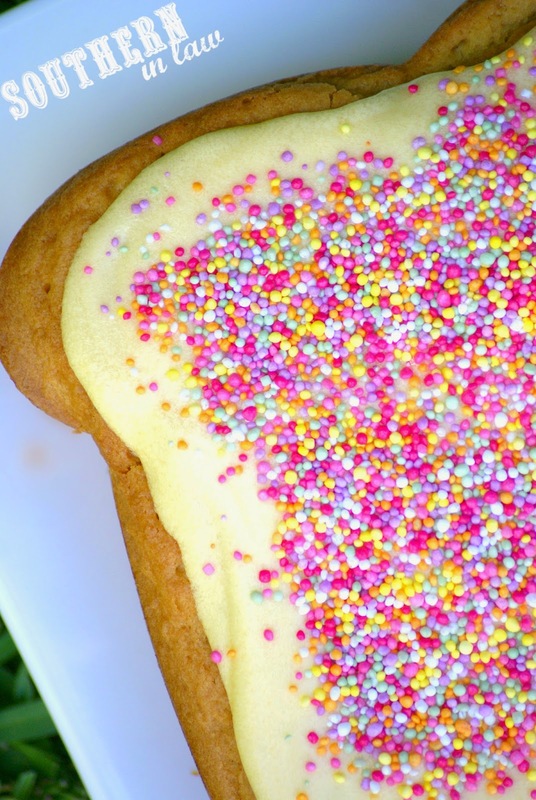 Haha, Fairy Bread is the perfect treat for a sprinkle fan! See, Jesse hates sprinkles so he doesn't get fairy bread - but he surprisingly LOVED this cake, sprinkles and all! Ooooh, I love ricotta and I bet the ricotta cake you're talking about was super moist! I have never heard of alfajores or korean peanut streusel bread but now I'm off to google them! Hey Jenny, that is a typo! Thank you for picking that up - I can be so dopey at times! It certainly is colourful - and delicious too!